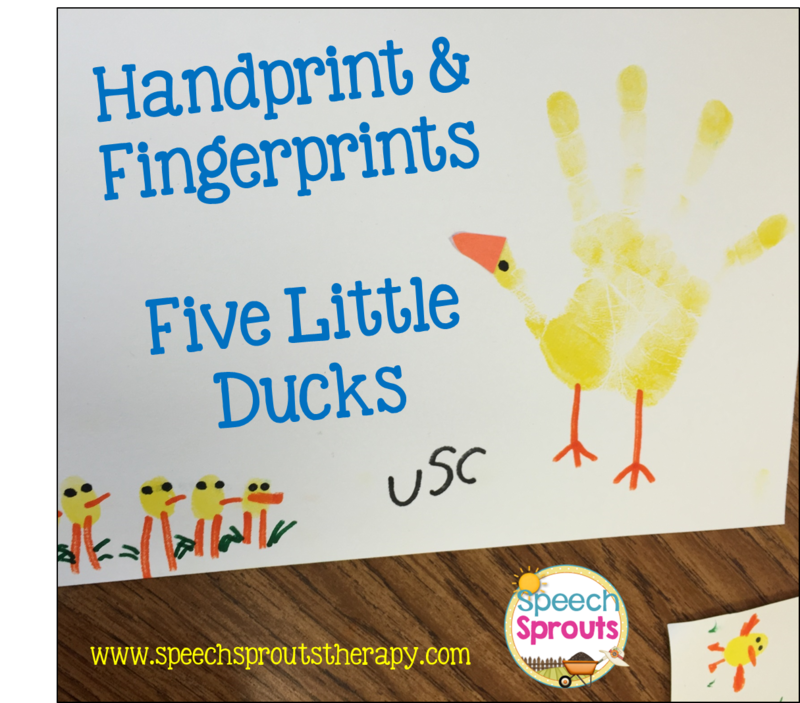 Speech Sprouts: Spring Speech Therapy Ideas That Are Just Ducky! 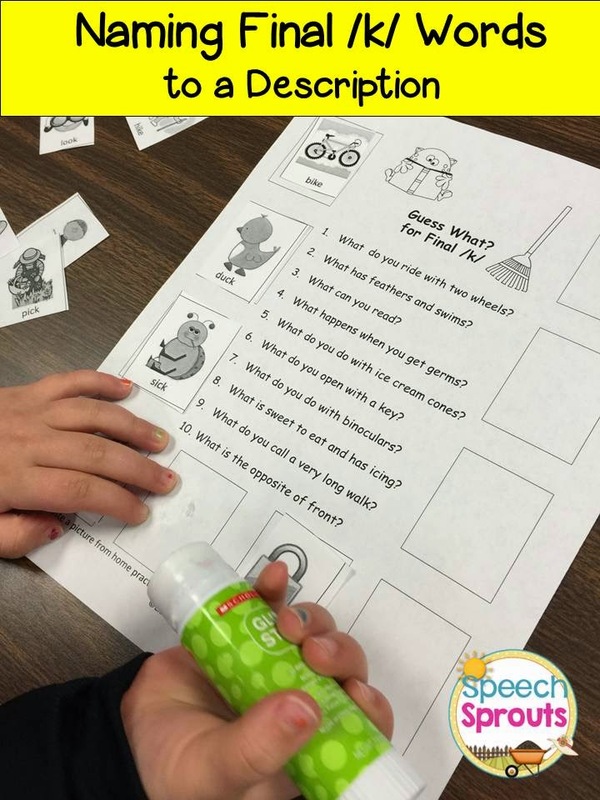 Need some fresh springtime speech therapy ideas for articulation and language? Try some nursery rhymes with your littles! 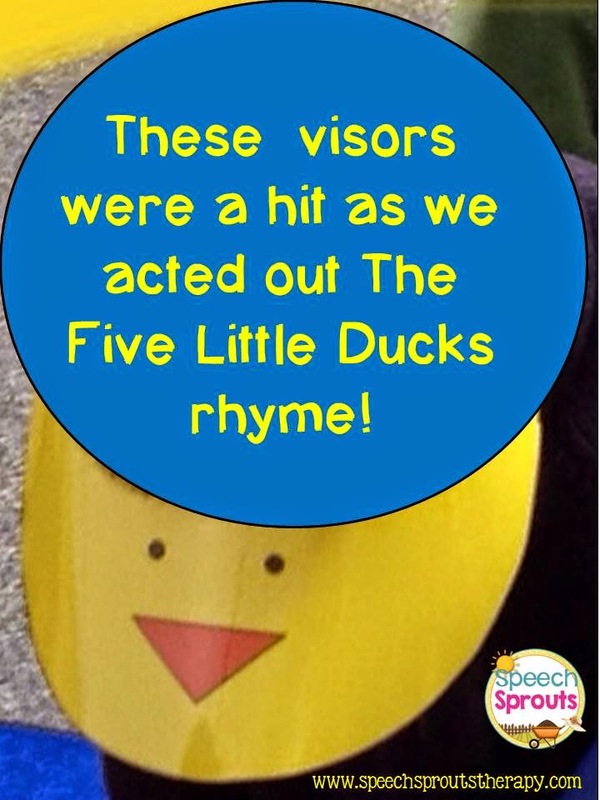 Last week, we were feeling just ducky in speech therapy, groovin' along with The Five Little Ducks. 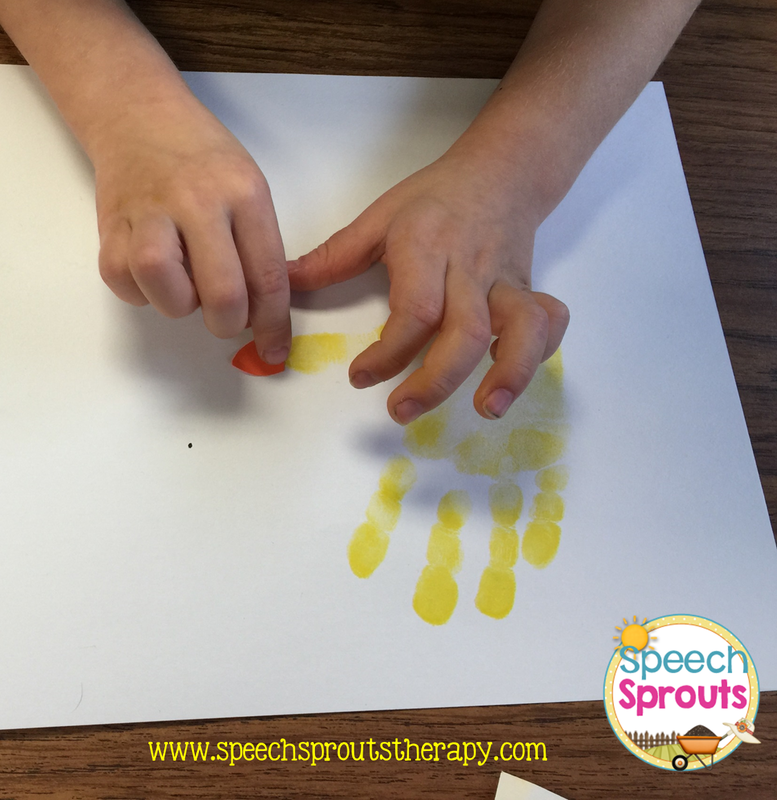 I love using nursery rhymes and fingerplays in therapy. LOVE them! Little ones truly benefit from repetitive text and songs. You get built-in practice with repetitive lines in a perfect child-friendly, familiar format. You get rhyme, which is so important for developing early literacy skills. Sing along and children are engaging additional areas of the brain to help them learn. (We do a lot of singing in therapy.) Add the fingerplays movements and you have kinesthetic and visual cues to accompany the language learning. It's a natural. Five Little Ducks is one of my springtime nursery rhyme favorites. We get practice with final /k/ (duck, quack), final s-blend /ks/ (ducks), and initial /f/ (five, far). We get spatial concepts near/far and over. We sang the song, read the story, and acted out the re-telling! There are several versions of the song on youtube you can listen to if you need to learn the melody, such as this one by the Learning Station: Five Little Ducks. I use these actions to go along with it: Hold up your hand and show your fingers for the number of ducks as you sing the number words five, four ect. I shade my eyes and look around as I sing "far away". When mother duck says "quack, quack, quack" I put my hands in front of me, palms facing each other and move them up and down like her beak quacking. When it's father duck's turn to quack, I say it in a deep, loud, slow voice and move my hand way up and down for a BIG beak quacking! After we learned the song, we read the story. Remember... repetition is your friend! The kids loved the interactive flipbook pictured above from my Five Little Ducks Unit. They approve any time we get to pull velcroed story pieces off a book. We got in even more articulation practice for final /k/. After the story, we wore these visors and acted it out as we re-told the nursery rhyme. Then it was time to head to the table for more activities. 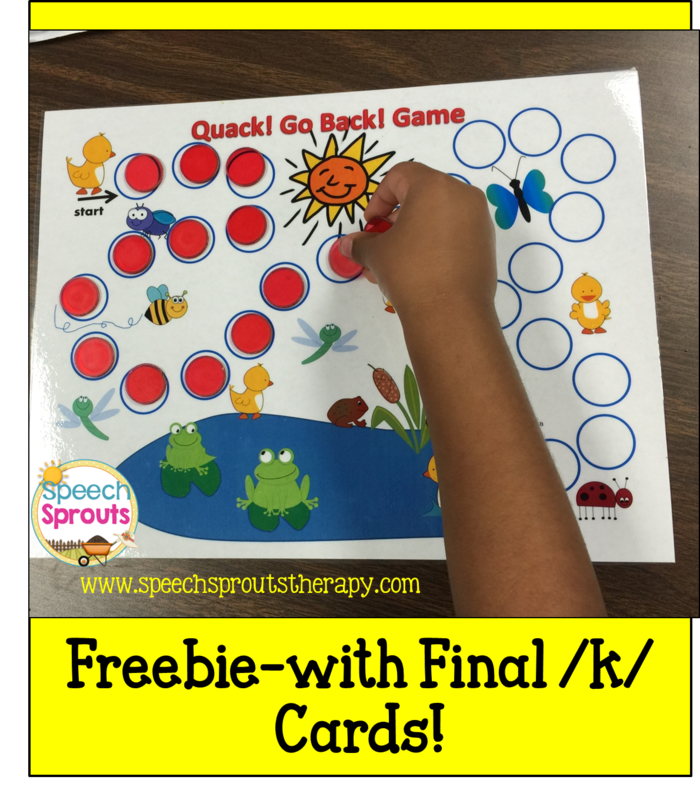 This game is a freebie at Speech Sprouts and comes with 20 Final /k/ articulation cards. The kids had fun helping the duck get to the pond with this game. We used bingo chips to cover the spots as we said our words. Everyone helped for some non-competive fun. Older kids enjoy having game tokens and rolling dice to advance. You can download this free game here: Quack! Go Back! Game. We worked on naming those final /k/ words to a description. I read the clues to my little ones, and they did great picking out the pictures to answer! We sorted the animals into categories. Do they live in the pond or on the farm? 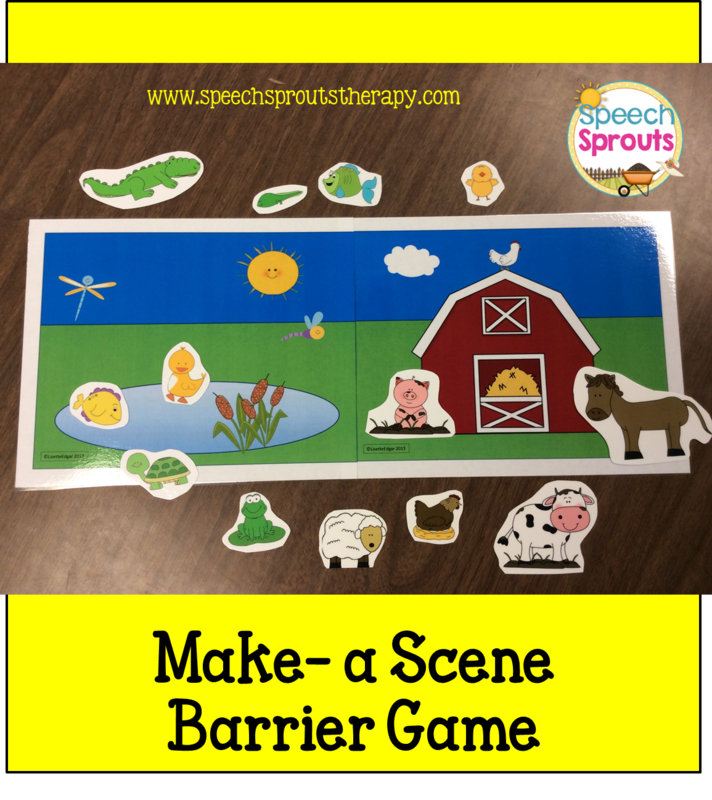 We followed directions with a barrier game. This is a great cookie sheet activity too. 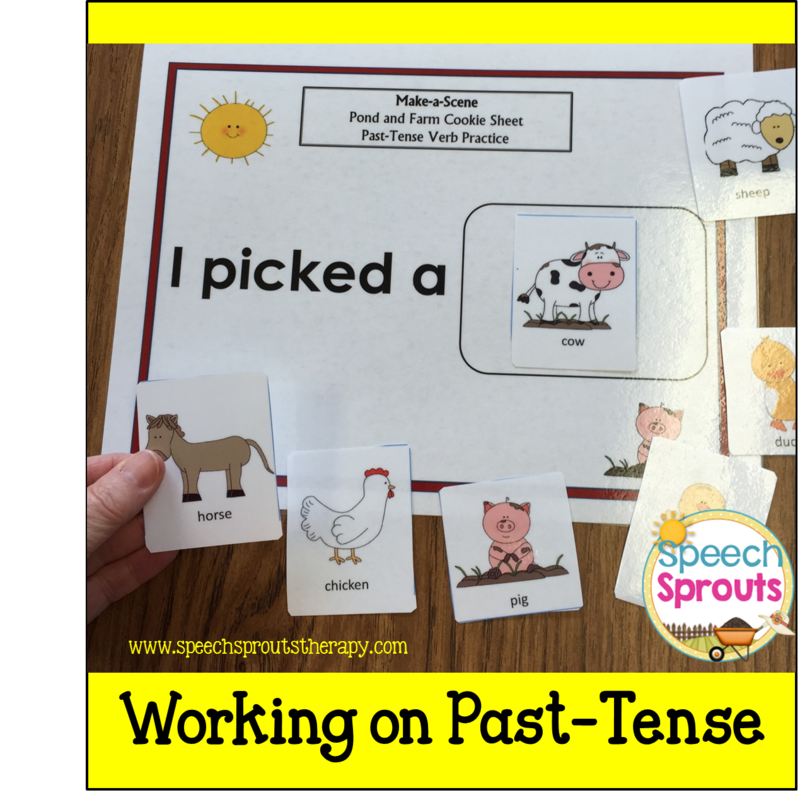 We practiced regular past-tense verb -ed endings. Turn the cards face down. Little ones love flipping them over to see what's next. We topped it off with a fun art project. 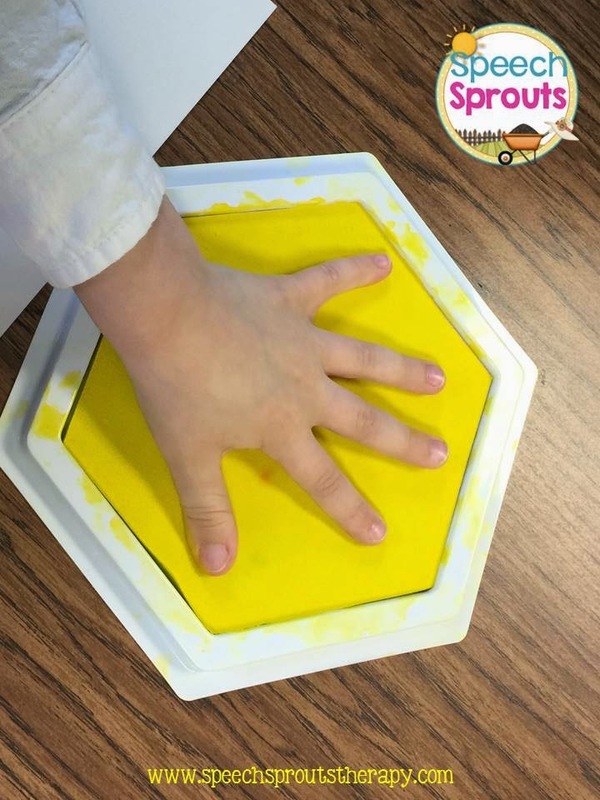 We used these large stamp pads to make handprints. (I often borrow from our Pre-K teacher.) Fit in s-cluster practice by saying "stamp" for each one or practice /k/ with "duck" each time. You can use paint as well, but this is less messy. Stamp a little hand, making sure the thumb is pointed toward the center of the page. Then, glue on a construction paper beak, or draw a beak and the legs with an orange marker. Add eyes with a black marker. This is mama duck. Have the kids add thumbprints for the little ducks. They did great adding beaks and legs to the babies. Talk about large and small. So cute! 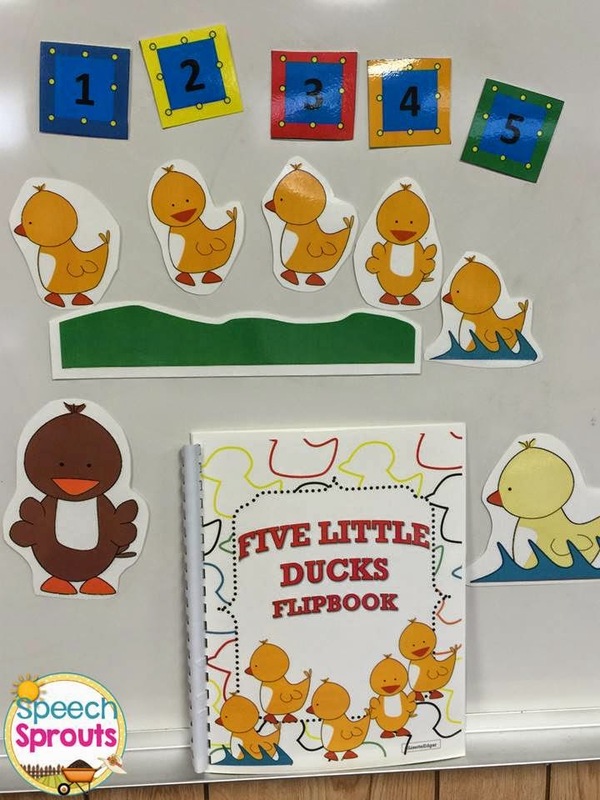 The Five Little Ducks Unit shown above has 15 activities which also includes wh? and yes/no question cards, a take-home mini-book, a sequence vocabulary sheet, dot marker page and more. 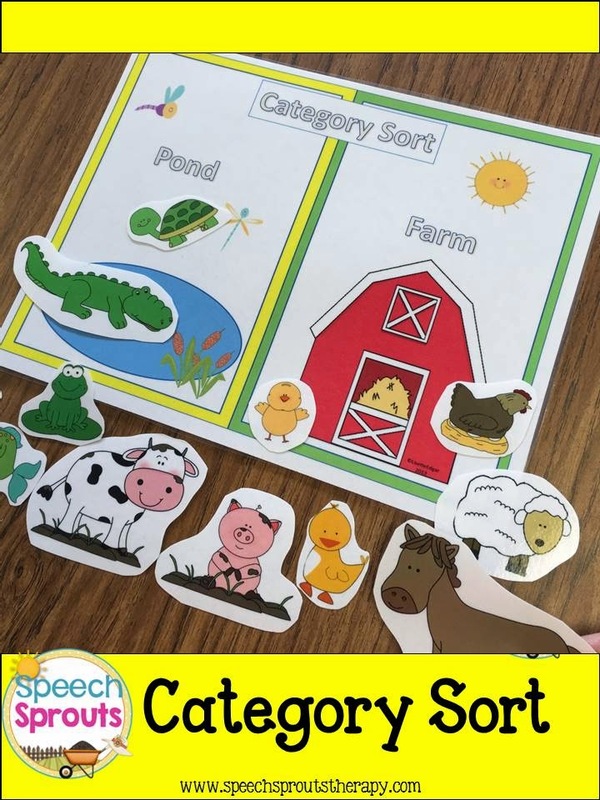 My little ones see me for two-hour sessions, but the unit can easily be broken up for multiple shorter sessions or pick and choose activities to fit your student's needs. If you missed my posts about the Itsy Bitsy Spider, you may want to check it our HERE and Day 2: More Spider fun HERE. It's another great nursery rhyme for spring bug themes.